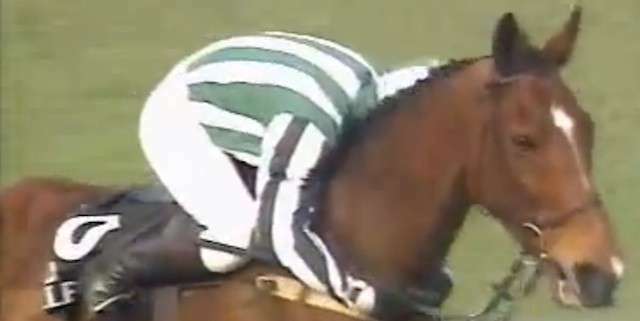 The 150th Anniversary of the running of the Grand National should have been a day for celebrations but an IRA bomb warning meant the crowd of 60,000 were bitterly disappointed when the course was evacuated. At 2.49pm a telephone bomb threat was made to Aintree University Hospital, followed by a second at 2.52pm to Bootle police control room, both used known IRA codewords. At least one device was said to have been planted inside the course. Once the racecourse was evacuated bomb disposal experts carried out two controlled explosions. The racegoers were unable to use their cars and coaches which were stranded inside the cordoned off racecourse resulting in thousands of visitors left high and dry in Liverpool. Many of the city's hotels were already booked up for the country's most popular steeplechase and racegoers had to rely on the hospitality of local residents. Many local people responded and opened their homes to the thousands of stranded strangers, providing food and a bed for the night. The experience reminded people of the World War 11 Blitz like spirit, leading to newspaper headlines reminiscent of that time, with one of the most famous being “We'll fight them on the Becher's”, a reference to Winston Churchill's inspiring war time speech. Determined to defy the terrorists the police and racing authorities quickly re arranged the race to be run two days later on Monday 7th April. Princess Anne, the Princess Royal, was amongst those people who returned to see the race on Monday, with the then Prime Minister John Major also present. Go Ballistic was the 7/1 favourite at the start ridden by the previous year's winning jockey Mick Fitzgerald. Fitzgerald was unable to make the allocated weight as were many other jockeys after the two day delay. Suny Bay was the second favourite at 8/1, a grey who was the housewives favourite, he had an impressive win in the Greenall's Grand National trial at Haydock in February. Suny Bay ran well until the fourth fence from home when a bad mistake cost him dearly. The favourite Go Ballistic struggled to keep up with the leaders and was pulled up at the penultimate fence. 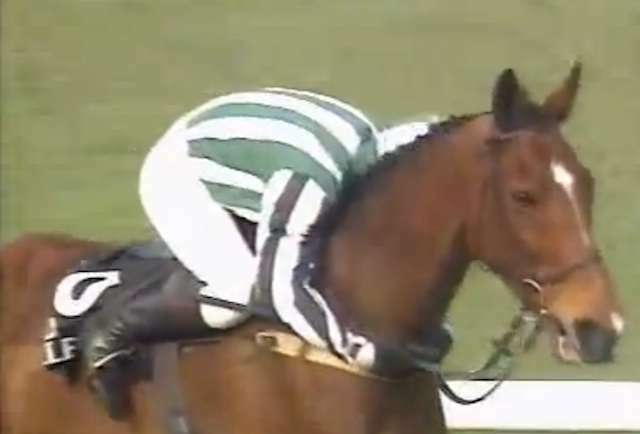 Smith's Band trained by Jenny Pitman fell fatally at the 20th fence, a second horse Straight Talk, was also fatally injured during the race. Lord Gyllene ridden by Tony Dobbin had been the ante post favourite a few days before the race but started at 14/1 on the day. 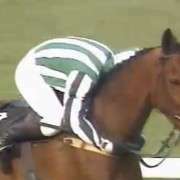 This Grand National was the definition of a one horse race, with Lord Gyllene producing a relentless gallop from the off and winning in a time of 9 minutes 5.9 seconds. Suny Bay made a valiant effort to stay in contention, only to finish 25 lengths behind with the gallant Camelot Knight in third place. It had been feared that the re arranged race would be an eerie, poorly attended event, however more than 20,000 spectators returned on Monday teatime to cheer on the jockeys and horses.